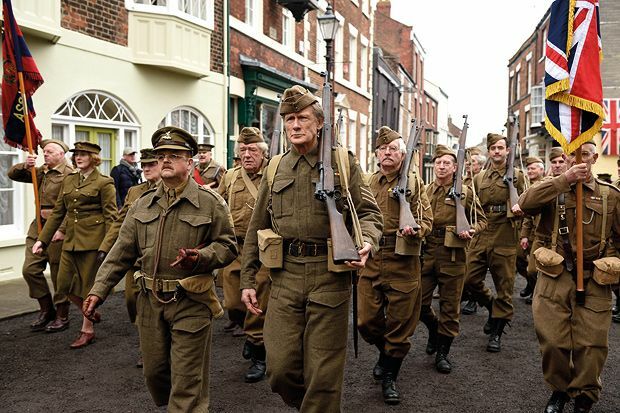 Watching Oliver Parker’s big screen take on beloved sitcom Dad’s Army will more than likely leave you with a strange feeling of déjà vu. Set in 1944, this wartime comedy about Home Guard volunteers in the fictional Walmington-on-Sea does a pretty eerie impersonation of the original show. True, the set-pieces are bigger and it’s more cinematic, but close your eyes and listen to Toby Jones, as pompous bank manager Captain Mainwaring, and you could be fooled into thinking it was Arthur Lowe. Likewise, with Michael Gambon as doddery Private Godfrey, Daniel Mays as spiv Private Walker, or Tom Courtenay as Corporal Jones. Hamish McColl’s script carefully approximates the feel of the TV series, mixing in nostalgia for the British bulldog spirit with cheeky seaside postcard innuendo. The show’s catchphrases are woven in but not overused, while the plot – which finds a German spy in their midst – feels like something creators Jimmy Perry and David Croft could’ve dreamt up (and probably did). At least this new version places more faith in its female characters. Catherine Zeta-Jones is Rose Winters, a journalist reporting for The Lady on the Home Guard and Felicity Montagu finally puts a face to a name as Mainwaring’s wife (who was always unseen on TV). Their presence has the effect of making the men even more bumbling than usual – notably in a scene where Mainwaring, Sergeant Wilson (Bill Nighy) and ‘stupid boy’ Pike (Blake Harrison) all converge on Miss Winters’ cottage in the hope of seducing her. The problem is, the film seems entirely pointless. The original sitcom ran for 80 episodes over nine series (and inspired its own inferior movie at the time), which makes you wonder why not just revisit those again, instead of rebooting a classic with actors who, while evidently doing their best, are always going to be inferior imitations. Brave but ultimately foolhardy; never mind you have been watching, you have been warned. General release from Fri 5 Feb.